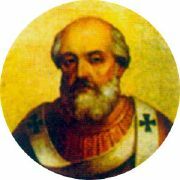 Adrian II (also known as Hadrian II), (792–872), pope from December 14, 867 to December 14, 872, was a member of a noble Roman family, and became pope in 867, at an advanced age. This was a turbulent time, with rivalry among Charlemagne's heirs destabalizing the political context. Dependent on the protection of the Frankish kings from manipulation by others, Adrian found himself more or less answerable to Louis II of Lorraine. His five years stewardship of the papal throne, however, saw a real attempt at reconciliation with the Patriarch of Constantinople and some internal consolidation of Papal authority within the Western Church. Unlike many of his successors and some of his own contemporaries within the hierarchy of the church, he did not compromise spiritual integrity for the sake of power but was a genuine servant of the poor. Adrian was born in Rome into an aristocratic family, of which Popes Stephen III and Sergius II had been members. Comparitively little information is available on the personal and early lives of the Popes at this period. It is likely, however, that he entered the papal household at an early age and rose up through the ranks of the Roman Church until he became a Cardinal. Before his election as Pope in 867, he had twice been offered but refused the see of Rome. When he did accept he was already seventy-five years old. He had married before ordination and fathered a daughter. It was not unusual for married men to be ordained at the time. Indeed, clergy marriage itself was still practiced, although increasingly discouraged. Clergy who were already married promised to abstain from sexual relations. Some sources say, though, that Adrian "refused celibacy." At this period, it was also not uncommon for bishoprics to be inherited or purchased and some who held the title never took holy orders. Adrian, however, already had a reputation for piety and for his generosity towards the poor when he was acclaimed Pope. This was a period when the Papal establishment more or less ruled Rome and the Papal States but was vulnerable to external threat and indebted to the Frankish monarchy, raised to the rank of Holy Roman Emperor by Pope Leo III in 800 C.E., for protection and security. While in theory, according to the Donation of Constantine, a document that emerged during the Papacy of Adrian I, the Pope was the successor to the temporal authority of the Roman Emperors, the Holy Roman Emperor claimed the right to approve or veto a Papal appointment. The main political challenge that Adrian II faced was trying to keep the peace between Charlemagne's grandsons, who competed for power. After the death of Charlemagne's son, Louis the Pious in 814 C.E., although Lothair (or Lothar) became Emperor as Lothair I, the territory was split between all three brothers according to Frankish custom. Subsequently, a struggle broke out between the Emperor and his brothers Louis of Lorraine and Charles (the Bald). When Lothair died in 855, his territory was also sub-divided between his sons, Louis II (Emperor until 875), Lothair II and Charles, which again weakened their ability to defend Rome. Charles the Bald, who coveted the title of Emperor, did not recognize Adrian. In 867, during Adrian's consecration ceremony, Lambert I, Duke of Spoleto pillaged Rome. Adrian excommunicated him and made certain that Rome has the protection of Louis II in the event of a similar incident. He supported Louis' claims for the imperial succession, and crowned him in 872. Lambert I may have supported a different papal candidate. Adrian also repaired relations between Rome and Lothair II, strained during the papacy of his predecessor over the question of Lothair's re-marriage following his divorce. The price of supporting Louis was that he had to serve his interests, and submit surveillance by Arsenius, bishop of Orta (a non-ordained Roman aristocrat), his confidential adviser, and Arsenius's son (or nephew) Anastasius, the papal librarian. Adrian's wife and daughter, who were still alive when he ascended the papal throne, were carried off in 868 and assassinated by Anastasius's brother (or close relative), Eleutherius. Anastasius may briefly have been anti-pope after the death of Leo IV (855). There was considerable rivalry between Rome and the Byzantine Empire centered in Constantinople at this time. The former objected to the latter's claim to be the true heir of the Roman Empire, and were offended by the use of the term "New Rome." Nonetheless, Adrian II was interested in reconciliation. One dispute was over whether it was the Pope who had precedence over the Patriarch of Constantinople, or vice versa. Patriarch Photius had actually issued a sentence of deposition against Adrian's own predecessor, only to be himself dismissed by the new Byzantine Emperor, Basil the Macedonian, who favored his rival Ignatius. An ecumenical council (called by the Latins the eighth Ecumenical Council) was then convoked as the Fourth Council of Constantinople to decide this matter. Adrian did not attend personally but sent representatives. They presided at the condemnation of Photius as a heretic. Another issue of concern to Adrian was whether Bulgaria was under Rome's, or Constantinople's, jurisdiction. His representatives did not succeed in coming to an understanding with Ignatius on this subject, and in fact Bulgaria would recognize the Patriarch's oversight. However, by allowing the use of Slavic in the liturgy in Moravia (Slovenia), and appointing the popular Bishop (later Saint]] Methodius as Archbishop, retained that portion of the East within Roman jurisdiction. This was a period when the internal system of discipline and decision-making within the Roman Catholic church was still evolving. As well as rivalry between Constantinople and Rome, other leaders within the Church were reluctant to concede that the Bishop of Rome had any jurisdiction in their diocese. The powerful Archbishop Hincmar of Reims objected to bishops under his jurisdiction having the right of appeal to Rome. Adrian steadfastly upheld the unlimited right of bishops to appeal to the pope, which did nothing to improve his relations with the Archbishop. Adrian died in 872 after five years as pope. Pope during politically turbulent days, Adrian II left the see of Rome no more nor less vulnerable than it had been before his election. He does not appear to have coveted the papacy for the sake or power or wealth, having actually twice declined appointment. This distinguishes him from many of his successors, for whom being Pope had more to do with power than giving spiritual guidance. The name 'Adrian' remained popular as a choice for newly elected Popes, which is itself indicative that his legacy was not regarded as tarnished or as compromised by the way he had carried out his pontifical duties. ↑ Adrian II Catholic Online. Retrieved August 14, 2018. ↑ Anastasius Bibliothecarius Catholic Encyclopedia. Retrieved August 14, 2018. ↑ Donna Woolfolk Cross, Pope Joan (NY: Ballantine, 1996, ISBN 0345416260), 413. This book is a work of fiction based on historical research. Cross points out that records from this period are very fragmentary, "scattered, incomplete, contradictory and unreliable." This page was last modified on 20 August 2018, at 21:55.